The natural gas distribution forms the final stage in the vast processing method. Like every other process, it involves various steps before reaching the consumer. Typically, the distribution of natural gas from delivery points to households and businesses comprises thousands of miles of distribution pipe. The U.S. Department of Pipeline and Hazardous Materials Safety Administration states that their distribution pipe is over two million miles in the country. The transportation infrastructures transfer the natural gas across various geographical zone making the distribution cost typically about half of the natural gas expense for small size clients and houses. Still, the demand for natural gas has never reduced because of its usage in various sectors. This need creates a vast opportunity in the natural gas distribution area. So, if you have ever decided to explore this segment, it is the right thing to do so. Blue Mail Media helps you in this task by providing all the necessary information required to contact the key-decision makers in this field. 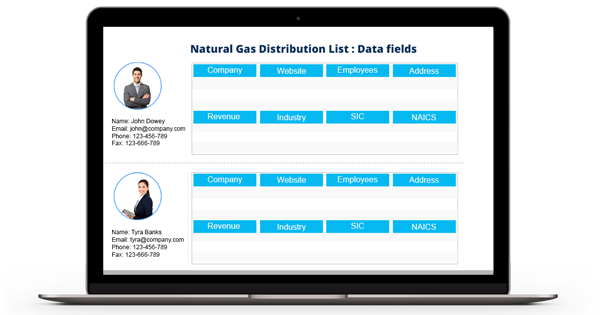 We offer you the prepackaged as well as customized Natural Gas Distribution Industry Mailing List that lets you reach the right targets at the right time. We, at Blue Mail Media, offers the highly-sophisticated Natural Gas Distribution Industries Mailing List that helps you have seamless interaction with your potential clients. Our GDPR compliant list has all the necessary marketing information that assists you to take the right decision. It gives you access to details such as first name, last name, company, job title, revenue, SIC code, NAICS code, and many more. Also, it helps you to connect with the prospects in various regions across the globe. That is, we provide the information about natural gas distribution industry in areas such as the US, the UK, North America, Canada, Europe, Australia, the Middle East, South Africa, and Asia. Besides, the data in our Natural Gas Distribution Industries Email Database guarantees high deliverability and reliability rate. The team of experts in our company puts great effort to maintain the accuracy of the email list. They make thousands of verification calls and also sends verification emails on a regular basis. Also, they gather the data for the Natural Gas Distribution Industry Executives List from highly authentic and reliable sources. Yellow pages, trade shows, conferences, business directories, and government records form the data source for our list. Avail our robust list by calling 1-888-494-0588 or sending an email to sales@bluemailmedia.com now!